Ease the stress of the day away with our CBD-infused calming supplement. Cured Zen is formulated to enhance sleep quality while melting away any unease. 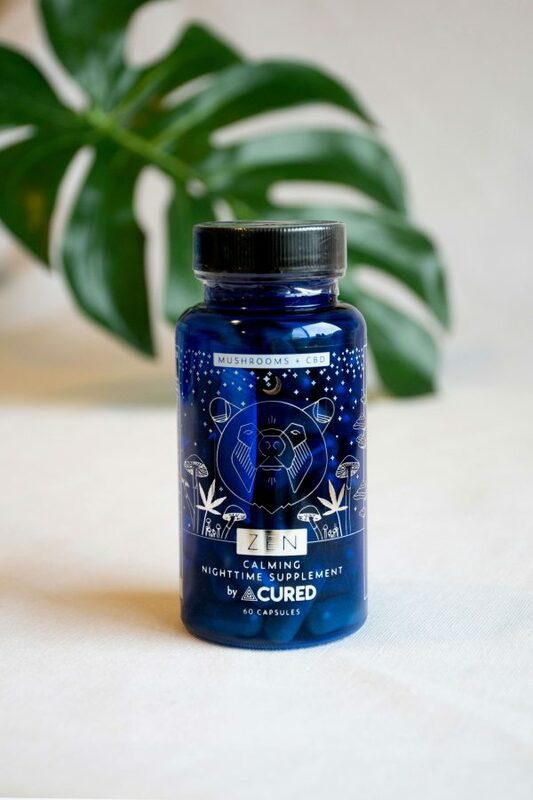 With soothing ingredients such as Magnesium, Reishi, Valerian, Ashwagandha, and Chamomile, this night-time formula is sure to compliment your efforts to unwind from the hustle and bustle of everyday life. Full Ingredient List: Cured Balance Blend (Valerian, Skullcap, Passionflower, Ashwagandha, Chamomile Extract), Reishi Extract (Ganoderma Lucidum), Magnesium (Magnesium Glycinate), Broad Spectrum CBD Extract (THC Free). *The Zen Supplement is not to be used with pregnancy or lactation, If you have a medical condition or take medications, please consult with your doctor before using this product. Do not take the PM supplement if you take buprenorphine / naloxone or sodium oxybate. I tried “cured zen” I took two pills and I slept the hardest I have ever slept in like years. I think that I should have taken 3pills and it would have been better. Just the two pills I got a full night’s sleep and Woke up feeling refreshed and ready to go. I absolutely love taking cured zen before bed! I haven’t slept this great in years. I wake up feeling so refreshed. The best part is I’m no longer having to hit the snooze button in the morning, I never feel groggy anymore! These capsules are wonderful. I recommend them to anyone who struggles falling asleep and staying asleep! I received a sample of Zen with my last order. I have never slept so soundly and felt at ease. I will definitely buy a bottle for my next purchase. Absolutely love this product! Perfect combination of ingredients allows me to relax and get a better nights rest. Love this! Had been having trouble sleeping lately, but started taking this at night and have been sleeping great and feel great in the morning. I’ve been incorporating CBD into my wellness routine for a few months now, so I was very excited to see a holistic, purpose-driven supplement. I wasn’t sure what to expect, but wanted to give it a try. A single capsule clears my mind and my stress. I’ve been sleeping through the night, recovering from hard training sessions, and overall feeling more centered. Highly recommended. Zen is legitimately life changing. I have such a difficult time both falling and staying asleep. With Zen, I am able to relax and fall asleep within a half hour and STAY asleep all night. I wake up feeling refreshed and ready for the day. I cannot thank Cured enough for this product, I will never be without it now. I purchased Zen, Rise, and hemp oil. I have a terrible time sleeping, which disrupts my waking life, thus creating a viscous cycle. These three products have helped me find a balance in all parts of my life. 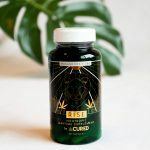 I sleep with the Zen (better), and because of that I’m a functional human, Rise is most excellent for kicking my brain into school mode, as well as gym time, and the hemp oil rounds out all the edges. Best night of sleep I have gotten in years. Beyond amazed by how good of a job it does to soothe and remove stress before sleeping. I love this stuff! I have trouble staying asleep at night. I take 1-2 pills every night before bed and I have uninterrupted, amazing sleep. I have had issues with sleeping for a ling time now- waking up through the night and always feeling tired. I had a bad headache for three days straight and tried Zen for the first time and WOW! Best sleep ever! Bonus- woke up with no headache! I will definitely continue to take this. This product has really helped me sleep through the night. I was getting up almost every 2 hours and by taking this product I only get up once if at all to use the restroom. Help me easily fall back asleep. I am truly greatful for giving it a try! The Cured Zen pills really helped me fall asleep! Felt refreshed in the mornings too. Purchased these for my boyfriend after ZZquill and Melatonin stopped working for him. He had never taken any sort of CBD product before so he was a bit hesitant at first. After one night of these he slept like a BABY. These pills have definitely helped him sleep and mellowed his anxiety. Great product and definitely recommend. I have been using this product for a little over a week and it has completely improved my sleeping pattern. Not only that I suffer from horrible stomach pains during the night and ever since starting this product those pains have completely disappeared. This will become a staple in my everyday routine. I’ve always struggled sleeping and staying asleep, but this .. y’all, this is a game changer. I’m getting the best of sleep of my life every night. I struggle falling asleep, but this knocks you out. I highly recommend it. Husband sleeps very well taking 2 of these a night and he used to wake up with a sore tummy sometimes before taking them…but since taking these, no more!